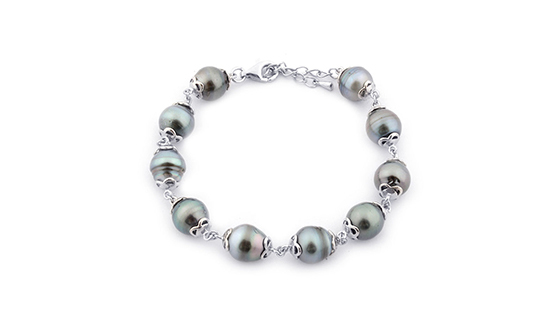 Tahitian cultured pearls are beautiful gems from a mysterious, picturesque land. Their exotic colors have captivated consumers’ imaginations since they appeared on the market in the 1970s. Each Tahitian pearl is unique. Sultry dark tones and a breathtaking range of natural color make these rare pearls prized throughout the world. Jewelers and pearl farmers must go through hundreds of pearls to find the perfect pick to create a single Tahitian pearl jewelry piece. Even finding two similar pearls to create a matching pair of earrings can be a daunting task, requiring many hours of work. Is Tahitian pearl valuable? The value of pearls is typically determined by a combination of six value factors, namely size, shape, color, luster, surface condition, and nacre quality. It is no different when determining what Tahitian pearl is worth. These guidelines will help you choose Tahitian pearl jewelry for your collection. Most spherical Tahitian cultured pearls measure between 9 and 14 millimeters, with the most common diameters between 9 and 11 mm. Occasionally, a Tahitian cultured pearl will reach 16 mm or even 18 mm! Approximately 40-percent of Tahitian cultured pearls are round or near-round in shape. For many, a round pearl is the ideal shape, and round Tahitian pearls are the most popular option in jewelry. About 23-percent of Tahitian cultured pearls are circled. When other value factors are equal, circled pearls are less valuable than pearls without circles. But circled pearls have their appeal. Some jewelry designers and consumers even prefer them. In recent years, baroque shapes have become more popular among designers and consumers as many like their unique irregularity. Tahitian keshi pearls have their appeal for the same reasons that people like baroque shapes. Keshi shapes are irregular, and each one is unique. Some cultured pearl buyers like the fact that keshi pearls are composed entirely of nacre. Tahitian cultured pearls are probably best known for their exotic colors. They are associated mainly with three deep, vibrant colors with exotic names. (i). Peacock is the trade name for a dark green-gray to blue-gray body color with pink to purple overtones. It’s often the color that’s most highly valued. (ii). Aubergine is used to describe Tahitian cultured pearls with a dark grayish purple body color. Aubergine means eggplant, and perfectly describes this color. (iii). Pistachio is the trade term for a yellowish green to greenish yellow body color. 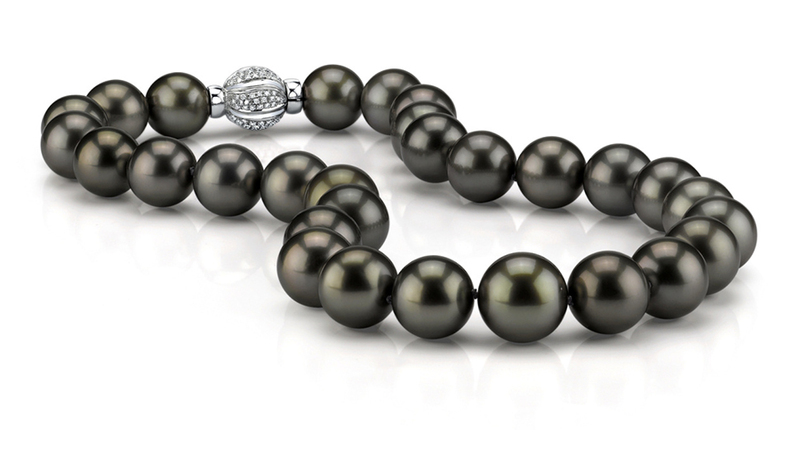 Gray and black are the most common body colors of Tahitian cultured pearls. Brown is less common. Overtone colors include blue to green, purple, yellowish green, and pink. Overtone can sometimes be so strong that it obscures or might be confused with body color. The luster of Tahitian cultured pearls ranges from fair to excellent. Some can approach a metallic sheen. It gives them an exotic look, especially when that luster combines with a different overtone. The surface of a Tahitian cultured pearl can range from spotless (extremely rare) to heavily blemished. Some Tahitian cultured pearls might be clean or lightly blemished over most of their surface but heavily blemished in one small area. In jewelry, those pearls are often positioned so the setting hides the blemish. During the pearl-growth period, the Tahitian black-lipped mollusk produces nacre that is 0.8 mm to 2 mm thick. Tahitian cultured pearl nacre thickness is usually listed as “Acceptable.” It means they generally don’t have a visible nucleus or chalky appearance that might be evident in other pearl types. Thick nacre is not necessarily high-quality nacre, but it does ensure durability. Cultured pearls are a little dull when they’re first harvested. Before they’re offered for sale, they’re washed in fresh water, dried, and lightly buffed, generally by dropping in a mix of finely ground salt and bamboo chips. Tahitian pearls are cleaned before they are offered in the market. They are natural, and no additional treatment has been done by the farmer. Pearls may be treated after sale, but this is uncommon. Treatments include bleaching, dyeing, and irradiation. Ranking 2.5 to 4 on the Mohs scale of hardness, pearls are very soft and easily scratched or abraded. However, pearls usually have good toughness. With care, they can be a jewelry item worn frequently. For routine care, wipe your pearl jewelry with a lightly damp, soft cloth after each wearing. Pearl jewelry should be the last item you put on, and the first item you remove. Avoid ultrasonic cleaners and contact with chemicals such as lotions, hairspray, and makeup. These can be absorbed, damaging your Tahitian pearl jewelry. To avoid scratching, store your pearls wrapped in a soft cloth or a lined jewelry box. Periodically, pearl strands may need restringing. This can be performed by most trained jewelers. Frequently worn pearl strands should be restrung about once per year. It is recommended to have a jeweler examine your pearl strand if a gap is beginning to appear between the drill hole of your pearl and the knot in the thread. Who Can Wear Tahitian Pearl? Tahitian cultured pearls have an effect that exceeds most people’s expectations due to their size and color. With this array of unusual colors and large sizes, round Tahitian cultured pearls offer jewelry designers unique opportunities. But strands of big, round, fine quality, and exotically colored pearls are not within everyone’s reach. Designers and marketers use creative ways to make Tahitian cultured pearls affordable for everyone. 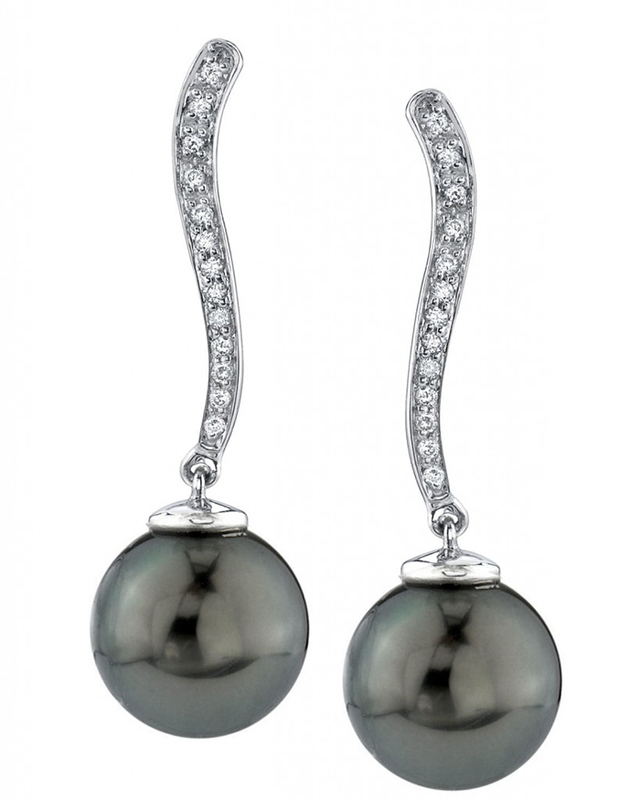 One way is to use Tahitian cultured pearls in earrings, rings, and pendants. These items use fewer pearls and are therefore more affordable than traditional pearl strands. How Does Tahitian Pearl Compare to Other Pearls? All pearls are unique, but Tahitian cultured pearls stand out as exotic. It is especially true of black pearls with colorful overtones. There’s no other pearl type with a color called “aubergine.” A necklace of clean, round, 14 mm, excellently matched, aubergine Tahitian cultured pearls is truly stunning! South Sea pearls display golden honey hues while Akoya pearls are loved for their classic white to cream body color. The distinctive color of Tahitian cultured pearls is directly related to the color of the mollusk’s mother-of-pearl lining. There is no other pearl in the sea like Tahitian cultured pearl! Where Does Tahitian Pearl Come From? Black-lip pearl oysters are farmed in French Polynesia, the Cook Islands, the Micronesian Islands, and to some extent Japan, Thailand, and the Philippines. 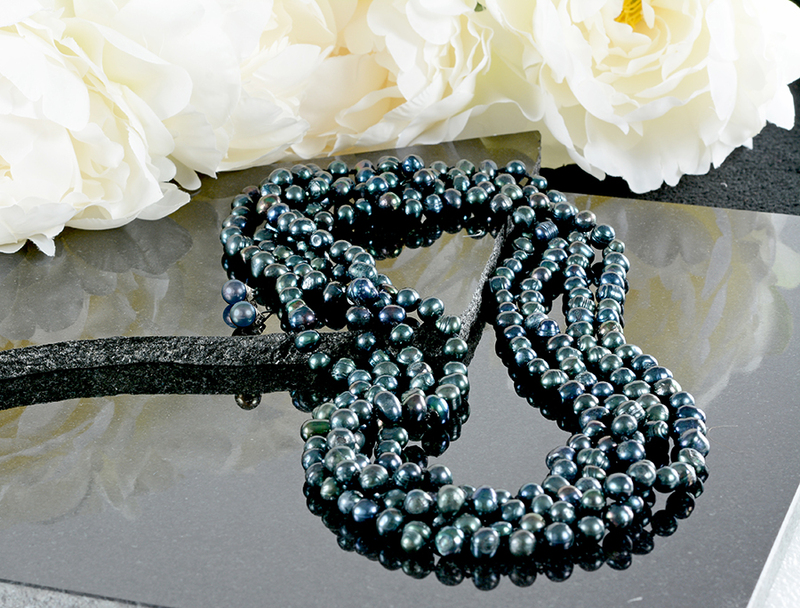 Only the dark beauties grown in exotic French Polynesia can genuinely call themselves Tahitian cultured pearls. Shop LC sources our supply of Tahitian cultured pearls directly from French Polynesia. How are Tahitian Pearls Grown? These glorious dark pearls are grown in the warm clear waters of French Polynesia by large black-lip oysters called Pinctada margaritifera. Pearl is not considered a true mineral due to its organic origins. However, pearls are formed from aragonite or a mixture of aragonite and calcite. When oyster larvae are attached permanently to a surface, they are called spat. To grow pearls, workers must cultivate spat. As wild mollusk populations have been severely depleted, they’re now protected from harvesting. Since there are no hatcheries in French Polynesia, the only way to obtain enough adults for pearl production is to collect spat and nurture them into adulthood. Cultured pearls are French Polynesia’s biggest export. The government has established minimum standards for Tahitian cultured pearl nacre thickness. Tahitian pearls are bead-nucleated with thick, colorful layers of nacre. It takes more than three years for spat to get ready for nucleation. The thinnest nacre allowed by French Polynesian law for export is 0.8 mm, which is considered extremely thick. After a pearl is removed from the black-lipped oyster another nucleus can be inserted, and another pearl can form. A black lipped oyster can be nucleated around 3 times before the mollusk is spent. Each time, the inserted nucleus is larger, meaning a larger pearl is produced. Pearl farmers rent their lagoon farming areas from the government. The French Polynesian government permits collection of spat only—no juveniles or adults. Tahitian cultured pearls are sold mostly through direct sales to visiting dealers, like the Shop LC buying team. What Does Tahitian Pearl Mean? In Tahitian legend, the Polynesian god Lono came down to earth on a rainbow for a princess, bringing black pearls as a gift with him. The god offered it to the princess as a token of his undying love and affection. A pearl necklace is believed to warn sensitive people of imminent disaster. It is also said that psychologically, pearls promote wisdom and contentment well into old age. Black pearls are also linked to Capricorn. 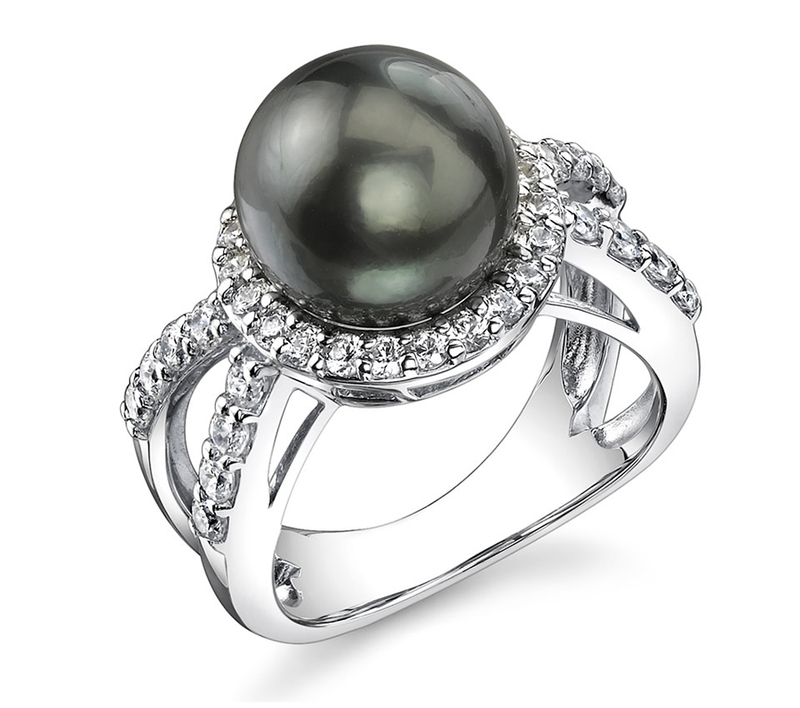 Is Tahitian Pearl a Birthstone? Pearl is the traditional birthstone for June. Many love them for their white, cream, peach and pink hues. Tahitian cultured pearls, with their sultry dark and colorful tones, is an exceptional alternative as a June birthstone, or for anyone who admires pearls! Ranks 2.5 to 4.5 on the Mohs scale of hardness. Color displays dark green-gray to blue-gray body color with pink to purple overtones. Tahitian cultured pearl from Shop LC undergo no additional known treatment. Also known as black pearl.